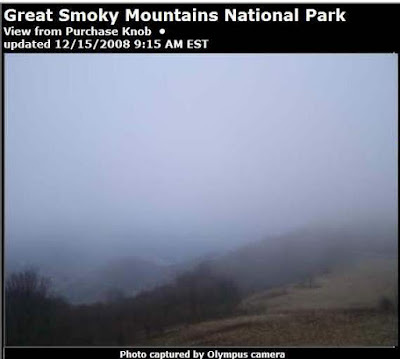 Everyday Ernie, a designer I work with, and I check out a webcam that’s in the Smoky Mountains. We do this because we both love the Smokies, and between conversations about our Indian heritages, our love of the west, etc. we like to see what’s happening up there in the hills. Today, while it’s raining here in Nashville, it’s a typical morning up there. Well, almost typical. It’s 50°….. In December….. I wonder if the bears are sleeping?